Garry Monk’s measured schedule over the summer appears to be paying off as the season reaches the pivotal Christmas period with Leeds showing no signs of ‘burn out’. Phil Hay reports. 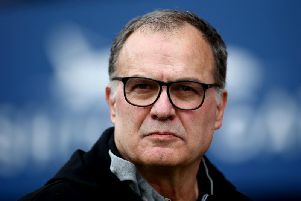 There are clubs like Leeds United with form in the Championship and others who have felt the strain of an unrelenting pace. Norwich City have one win in seven and Huddersfield Town only one in eight. Both are former leaders of a division which refuses to wait for anyone. Christmas is coming and Leeds are coming on strong, bringing to mind a promise made by Garry Monk in pre-season. United’s head coach dealt with repeated questions about a summer programme which looked light on friendlies and preparation time, at least in comparison to previous years. His answer was always to say that a measured schedule would prevent his players from peaking too early and “crashing and burning” at this stage of the year. The make-up of pre-season was undeniably odd; to an extent the product of Monk’s late appointment as head coach in June. Two friendlies in Dublin played out against weakened League of Ireland teams and Leeds crammed games at Guiseley and Peterborough United into the space of two days. A member of staff at Peterborough claimed United had originally asked to play them twice in the space of 24 hours, once on Friday and again on Saturday. In previous summers Leeds had contested as many as eight friendlies. At the time, Monk said: “You can do it in two ways. Load pre-season up with games and have a fantastic start but then you crash and burn. Or you can try and taper it. This season has followed that projection: an opening month in which Leeds seemed to be feeling their way into the Championship nervously, followed by a gradual but consistent incline in performances and results. Monk’s side are fourth in the table, joint top of the form table over six matches and preparing now for a seismic game at second-placed Brighton on Friday night. The squad managed by Simon Grayson that occupied an automatic promotion place on Christmas Day in 2010 held fewer points than the 32 Monk’s has accrued over 19 games. United’s head coach is reluctant to take credit for the impetus but others at Elland Road and Thorp Arch, some who observed previous campaigns and previous squads, say aspects of his management are paying off. Monk has been single-minded in his approach, doing the job his own way with his own choice of people around him. He stays in touch with owner Massimo Cellino but far less than some of his predecessors did. Cellino, helpfully, seems happy with their relationship and happy to stay at arm’s length, no longer all over the playing side of the club. Questions about the Italian’s mood and support no longer dominate weekly press conference. Monk was clear in the summer that Giuseppe Bellusci – for so long perceived as a bad apple at Thorp Arch – had to leave. He was equally clear towards the end of August that the pecking order amongst his centre-backs left no room for Sol Bamba and that a deal to sever Bamba’s contract would be in everyone’s interest, avoiding the unhealthy situation of the club’s captain kicking his heels. At an early stage of the season he decided that Luke Murphy, Toumani Diagouraga and Ross Turnbull were surplus to requirements and took that decision with no ambiguity. Murphy, Diagouraga and Turnbull have been working with the Under-23s ever since. There are players at Leeds, Rob Green and Pablo Hernandez specifically, who are into their 30s and in the hunt for one more big opportunity but Monk’s experienced professionals, the spine of his dressing room, have a common trait: mid-20s, ambitious and unfulfilled in terms of their careers. Kyle Bartley and Luke Ayling were Arsenal trainees and FA Youth Cup winners but neither defender has made an impression in the Premier League. Pontus Jansson is on the fringes of Sweden’s national team and still has a ceiling to break above him despite two years in Serie A with Torino. Liam Bridcutt, Eunan O’Kane, Liam Cooper and Chris Wood: relatively older heads who might have 10 years of football in front of them. There is much in common at Thorp Arch and Monk’s squads are said to socialise more readily than previous groups. There have been other, more subtle changes too. Monk took to arranging evening training sessions in midweek, making his players work at the same time as midweek games are played. It is a modern way of thinking employed by Huddersfield’s David Wagner among others. Before the season started Monk asked his players if they were happy persisting with their existing routine of staying together in a hotel on the night before home matches. Most preferred an evening with their families so the arrangement was scrapped. Training is said to be strict and intense – “sometimes the sessions are harder than games,” Kemar Roofe said on Saturday – but Monk is still relatively new to management, a player himself as recently as 2014. There is an apparent appreciation in him of how modern professionals think and what they want. There is also an underlying air of physical fitness at Leeds, characterised best by their League Cup win over Norwich City in October but also evident in the latter stages of Saturday’s 2-0 win over Aston Villa. Leeds have dropped only two points to injury-time goals this season, during a 1-1 draw with Wigan Athletic. They have scored no fewer than 11 times in the last 10 minutes. “We do a lot of hard work on the physical element,” Monk said. “Physically we put a lot of demands on the players to be in the right shape so it’s not a surprise.